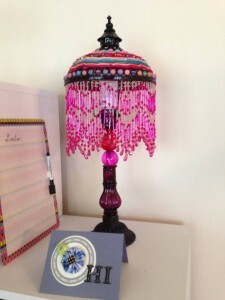 Hobby Lobby had their lamps on 50% off last week, so I got this for Mama’s House. Filed under Mama's House and tagged beads, cards, lamp, library, yo-yo's |	Comments Off on Another Bright Spot! I couldn’t resist a quick trip into Hobby Lobby as I passed through Mooresville, NC on Thursday. I couldn’t resist buying a copy of this magazine, either. 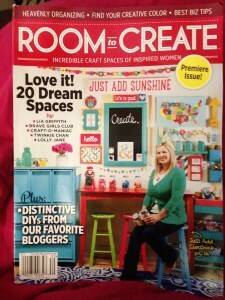 I figured it was a cheaper (not much) knock off of my beloved, “Where Women Create,” but I was pleasantly surprised. There are Q and A’s with each crafter, of course, with sources for the storage items (or similar), and instruction for a simple project from each maker. The photos were all glossy and bright, too, unlike my photo of the cover! I’ll take this down to Mama’s House and add it to my library. I am working on that library! I bought a monitor to go with my old Dell computer I moved down there. I hooked it up, and it worked! Now I’ve just got to get it mounted on its stand. (It’s surprisingly heavy!) My old keyboard and mouse look awful, so I need to shop for new ones. That should be a fairly inexpensive fix. I will report back.